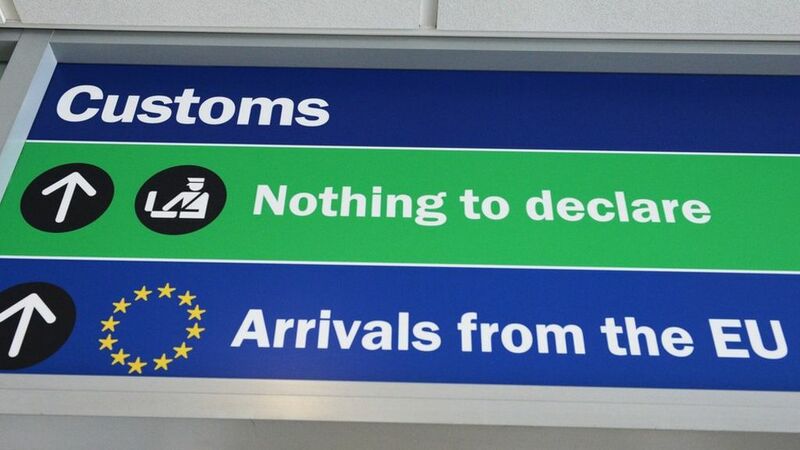 The UK’s new system for handling customs checks may not be ready by the time it leaves the EU, the public spending watchdog has warned. The National Audit Office said taxes might not be collected properly, international trade could be hampered and the UK’s reputation damaged unless proper contingencies were in place. Its head also raised fears about “vague” exit plans in Whitehall. HMRC said the system was on track and “fully capable” of coping with Brexit. The move to the updated Customs Declaration Service (CDC) was planned before the UK voted to leave the EU. Following the referendum result, its completion date was brought forward to January 2019 – just two months before Brexit is due to happen. “This provides little contingency time should the programme overrun or unexpected problems occur,” the NAO said. It said extra uncertainty was added by not knowing the outcome of the Brexit negotiations. Goods pass through UK customs whenever businesses import them into, or export them out of, the UK. At this point, depending on the nature of the goods, taxes and duties may be payable. As a member of the EU’s customs union, the UK does not impose taxes or require customs declarations on goods from other member states – but as part of Brexit ministers plan to leave the customs union and negotiate a new arrangement in its place. Revenue & Customs (HMRC) estimates this will mean the number of annual customs declarations will rise from 55 million to 255 million after March 2019, with an estimated 180,000 traders making customs declarations for the first time. The ageing system being replaced could cope with only 100 million declarations, the NAO said. Its report said progress had been made in moving to the new system, but that there was still a “significant amount of work to complete”. “HMRC faces some significant challenges to deliver the programme within the current timetable,” it said. Contingency plans had been identified for if the deadline was missed, the report said, but these had not been developed in detail. Brexit negotiations have yet to consider the question of the UK’s future trading and customs relationship with the EU – and the report said that until this had been agreed, “the programme is operating with some uncertainty, which increases the risk that management does not have a clear view on the amount of work still required”. Speaking ahead of the report’s launch, NAO head Sir Amyas Morse said there was “very little flexibility” in plans for the new customs system and that HMRC was not being given the support it needed to put strong backup plans in place. In the worst case, customs officials could revert to manual processing at border points but “that would be a bit of a horror show”, he said. Sir Amyas said Brexit was the biggest peacetime challenge to government but this was “only just beginning to click into people’s awareness in government”. “It needs to act as far as possible in a unified way, and we have an issue there because of departmental government,” he said. Sir Amyas said he had “expressed interest” to Brexit Secretary David Davis and officials at the Department for Exiting the European Union in seeing a report on the overall preparedness across government but the response had been “vague”. The NAO boss said he was not seeing evidence of strong integration between departments and warned it would be “very second best” to respond when problems occurred instead of planning for them in advance. Responding to the report, HMRC said: “The Customs Declaration Service is on track for delivery by January 2019 and will support international trade once the UK leaves the European Union. The British Retail Consortium said the NAO had “confirmed the scale of the task” of getting the UK’s borders ready for Brexit and it was concerned at the warning the new system might not be fully ready by March 2019.